It features multiple uses: playing, exercising, training, or simply keeping your pets safely. This rabbit hutch provides your pets with plenty of exercise space while the tight iron wire mesh helps prevent mischievous behaviors and unexpected accidents. 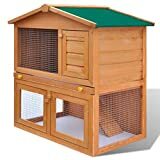 The rabbit hutch is built with high-quality wood frame, making it a strong and safe enclosure that lasts for years. Its green asphalt roof keeps rain away while the cozy cubby makes the perfect sleeping area. The top roof can be opened to catch or release your pets. A pull-out tray makes cleaning easy.